Aerosmith frontman Steven Tyler has checked into a drug rehabilitation clinic in Pasadena, Calif., according to the celebrity website TMZ.com. Responding to a query from The Boston Globe, Mitch Schneider, spokesman for Tyler and the band, said in an e-mail: "I don't know anything about it and have left word with the band's management." Tyler, 60, was in Las Encinas Hospital's rehab program yesterday getting treatment for "substance abuse," according to TMZ.com. (It's the same facility where the reality show "Celebrity Rehab" was filmed.) Tyler and guitarist Joe Perry were often called the "Toxic Twins" because of their hard-partying rock 'n' roll lifestyle. 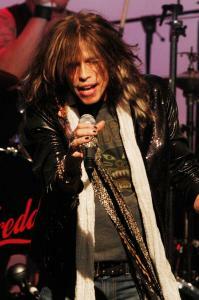 But in recent years, Tyler and the other members of Aerosmith had been outspoken about cleaning up their lives. In 2001, the same year the Boston-based band was inducted into the Rock and Roll Hall of Fame, Tyler had a wing at a Roxbury rehab clinic center named in his honor for his financial and outspoken support of Victory Programs. Tyler was even able to joke about dealing with past demons. In a 2002 interview with the Globe, Tyler explained his willingness to do a "Got Milk?" ad: "Hey, if it's funny enough, do it. I mean, I would do an ad for rehab if they used [our song] 'Take Me to the Farm.' One thing I learned from the '80s is that it's good to have a sense of humor." CN8 host Barry Nolan , who publicly complained a few weeks ago about Bill O'Reilly receiving an award from the Boston chapter of National Academy of Television Arts & Sciences, has been fired by the Comcast network. "Their take is that I was insubordinate," Nolan told us yesterday. "They wanted me to sit down and shut up." The host of "Backstage With Barry Nolan" had argued that O'Reilly, the volatile Fox News host and former Channel 7 anchor, was unworthy of the Governor's Award. (Past recipients include the likes of Mike Wallace, Ken Burns, and Natalie Jacobson.) "The idea of honoring someone who does their job with constant factual errors, name-calling, and mangling of the truth . . . It's ridiculous," said Nolan, who's married to Garland Waller, a veteran TV producer who teaches at Boston University. We're told Nolan was warned by his bosses at CN8 to pipe down, but at the May 10 dinner honoring O'Reilly he handed out a six-page document listing some of O'Reilly's wackier errors, utterances, and information about the talk-show host's sexual harassment settlement. Seems Comcast was concerned that Nolan's actions could harm the network's relationships with the academy and Fox. He was immediately suspended without pay for two weeks and then fired over the phone Tuesday. CN8 spokeswoman Beth Bacha wouldn't say much yesterday, but she did confirm that Nolan is "no longer employed" by Comcast. "Backstage" will continue with Sara Edwards, she said. As for Nolan, who hosted "Hard Copy" in the '90s and later worked for "Extra!," he said he has no immediate plans: "I'm going to cook out on the grill and get my lawn looking good." While the rest of us were lamenting Ted Kennedy's grim diagnosis, the right-wing radio crowd is all but celebrating the senator's brain tumor. "My mother taught me that if you don't have anything nice to say, don't say anything at all," said WTKK-FM (96.9) loud-talker Michael Graham. "So I don't have anything to say about Ted Kennedy." Isn't that thoughtful? Worse, though, was syndicated talk-show host Michael Savage, who spun a song by the Dead Kennedys and then told a caller: "You know I'm playing the Dead Kennedys not to mock Ted Kennedy. It's just appropriate, that's all." Savage, heard locally on WRKO-AM (680), continued his boorish behavior by playing an audio clip from the film "Kindergarten Cop," in which Arnold Schwarzenegger's character says, "It's not a tumor." We tried to reach Savage yesterday, but a secretary told us that he was out to lunch. You can say that again. WBZ leads at 11 p.m.
With only last night left to measure in the May "sweeps" period, WBZ-TV (Channel 4) was poised for a sizable victory in the hotly contested 11 p.m. newscast. WHDH-TV (Channel 7) and WCVB-TV (Channel 5) were in a virtual dead heat for second place, with Channel 7 holding an extremely narrow lead. Meanwhile, Channel 5 was set to claim victory in the early morning, noon, and evening newscasts. WFXT-TV (Channel 25) was in fourth place at 11 p.m., but its 10 p.m. newscast enjoyed a large lead over rival WLVI-TV (Channel 56). Seems Tom Brady and his supermodel girlfriend only travel as a pair. Gisele Bundchen was spotted having lunch Tuesday at Cafeteria on Newbury Street. No. 12's in town this week for Patriots passing camp...Rob Lowe was seen dining at Prezza in the North End last night. Three-time Olympic medalist Edwin Moses and three-time Tour de France winner Greg LeMond were at the Worcester Public Library yesterday as the city unveiled a statue to 1899 world cycling champion Marshall W. "Major" Taylor, who was known as the "Worcester Whirlwind." The statue, by Antonio Tobias Mendez, is the Central Mass. city's first monument to an African-American, according to Worcester officials. The New England Conservatory held its reunion night for alumni at Fenway Park on Tuesday, and the school's president, Tony Woodcock, did his best to cross the plate with the ceremonial first pitch. Newly minted NEC grad Melanie Campbell, a soprano, seemed more in her element as she sang the national anthem. Don Aucoin of the Globe staff contributed to this report. Names can be reached at names@globe.com or at 617-929-8253.